We are about to break that mold in Bailey. ϖ	How can I protect my home from a wildfire? My business? ϖ	What can we do as a community to ensure a safe evacuation in the event of a wildfire? ϖ	What is our evacuation plan? What is my plan? What is the school district plan? ϖ	What can we do about the risk of insurability? ϖ	How can we make sure that our fire protection district is adequately funded? ϖ	What can we do as a community to protect our forest eco-services? How do we avoid the prospect of living in a dystopian forest of black sticks? ϖ	How can we avoid the flooding danger resulting from a large burn scar? ϖ	How will a fire affect my well? My septic system? ϖ	What is the true long-term cost of a wildfire? ϖ	What is our recovery plan? When the Sheriff calls for a wildfire evacuation there will be chaos. The call could happen at any time of day or night. Hundreds of vehicles may be attempting to evacuate. In the midst of this chaos, it is absolutely essential that our major evacuation routes not be in flames. Traditional federal and state sources of funds for wildfire mitigation specifically exclude roadway mitigation. Think of this $100,000 project as an investment in our collective safety. No one is going to do this for us, our Bailey community will have to do this on our own. Just $25 per household would get the job done. You can find the whole “Safe Evacuation” story by following this link. 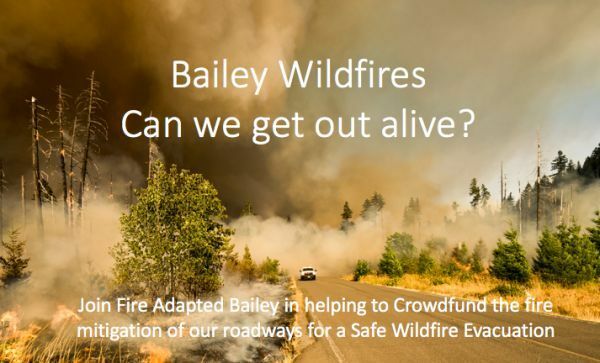 Post subject: Re: Bailey Wildfires - Can We Get Out Alive? I would be happy to donate to Park County offices or any of our fire departments. My understanding is FAB has, with great effort, worked out agreements with the Park County commissioners, Platte Canyon and Elk Creek Fire Departments to put this plan in place. Funding has been the issue and this was determined to be the most efficient and least costly solution. Representatives for the commissioners and both fire departments attended and spoke at the meeting we attended to launch this fund-raising effort. Our donation is going straight to the 501(c)3 that is Fire Adapted Bailey. We have never been huge on crowd-funding accounts, but we are certainly supporting this effort financially. Our lives, properties and that of our neighbors is at stake. BGR and company has been finding, extinguishing and reporting abandoned camp fires in the dispersed camping areas of Deer Creek for years. To us, it is a matter of when, not if, the catastrophe occurs. And the one-way- in, one-way-out is terrifying. This is a solution to the bottle necks that make it frightening. A huge amount of volunteer time and money has been put into this effort. HOAs are supporting it. The Flume had a reporter at the meeting and I'm sure there will be an article in next week's paper. will be doing the mitigation, so all the funds will go to Platte Canyon Fire and will stay in our community. Good to know the background & support for this. I certainly think it is a wonderful idea. I will be more trusting in the future. if you keep it public land oversight and not private land...you will do just fine. all the funds will go to Platte Canyon Fire and will stay in our community. That's a key aspect for me, that ALL the funds will go directly to OUR fire department and will ONLY be used for this specific project. So crowd funding is really our best choice for getting this work done. Can you imagine being trapped on CR 43 (or CR72 or Mt Evans) trying to get your family and pets to safety? Can't move forward, can't move backwards and the wildfire is closing in on you. How much are you willing to pay to minimize that scenario? Please help our community be a little safer. I was just so glad to hear that this is a community fund to be paid to the proper parties. I am definitely willing to help out to make this fund larger. These are the sort of donations that can add up and help to make ours a safer community. If you prefer to send a check, here is the info. Check payable to Fire Adapted Bailey with Bailey Wildfire in the memo line. What is the address if we want to mail a check?? ?